Different payroll systems have been devised for meeting the requirements of both employees and employers. Usually the employer makes a specified monetary payment to workers for a specified work or job done. The specified monetary payment could either be related to a particular hours of attendance or to the quantity of work. >> Practice Multiple-choice Question Labor Costing MCQs. This system is similar to the above two plans. The worker is guaranteed at ordinary rate of wages and premium or bonus is paid in respect of time saved. Under the Rowan system the premium rate is calculated as the proportion of time saved to the standard time allowed. 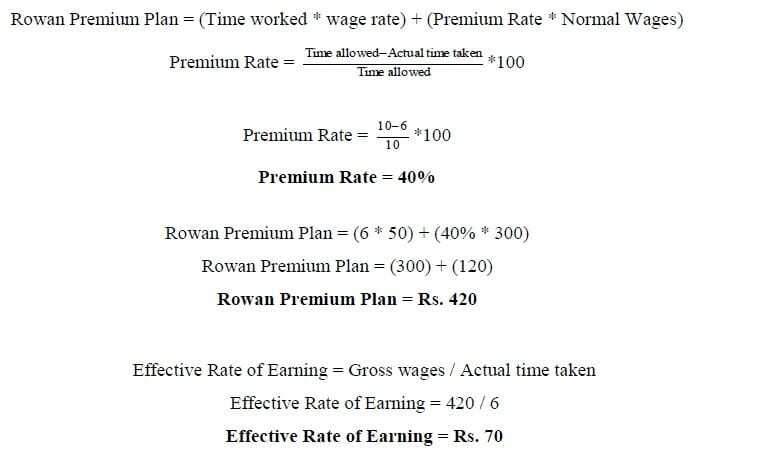 In order to get premium amount premium rate is multiplied by normal wages. >> Further Readings Factory Overhead. >> Other Practice contains Cost of Goods Sold Problems and Solutions. Under this method of remuneration a worker is paid on the basis of production and not time taken by him to perform the work. Piecework is where a fixed amount is paid per unit of output achieved irrespective of the time spend.This is one of the simplest and most commonly used of all incentive schemes. The rate is expressed in terms of certain sum of money for every unit produced, e.g. Rs 2 etc. Wages are paid in this system in accordance with the output of production. This is independent of time spent on the job. If a worker produces 25 pieces per day and he is paid at the rate of Rs. 20 per piece, what will be the total wages per day? Calculate Mohsin’s wages of this week? 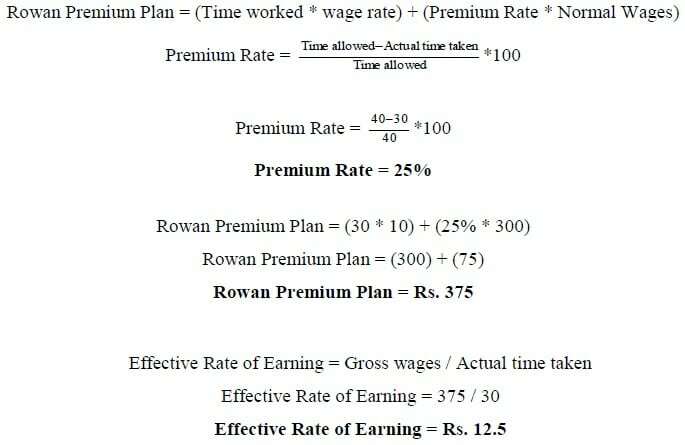 From the following particulars, calculate the earnings of workers under Taylor’s Differential Piece Rate Plan. From the following particulars calculate the total earnings of the three workers who are paid wages under the Merrick Differential System. The personnel department of a company has supplied the following information relating to its work force during the month of June, 2011. During the month 60 persons were discharged and 20 left the company. During the month 200workers were engaged out of which only 40 workers were appointed against the vacancy caused by the number of workers separated and the remaining on account of an expansion scheme of the company. Calculate labor turnover rate? ABC Company budgets to make 27,000 standard units of output (in four hour each) during a budget period of 108,000 hours. Actual output the period was 27,000 units which took 120,000 hours to make. Find the Efficiency Ratio?